This is a set of two JConcepts Double Dee's 2.2 1/10th Truck Tires, in Green compound. 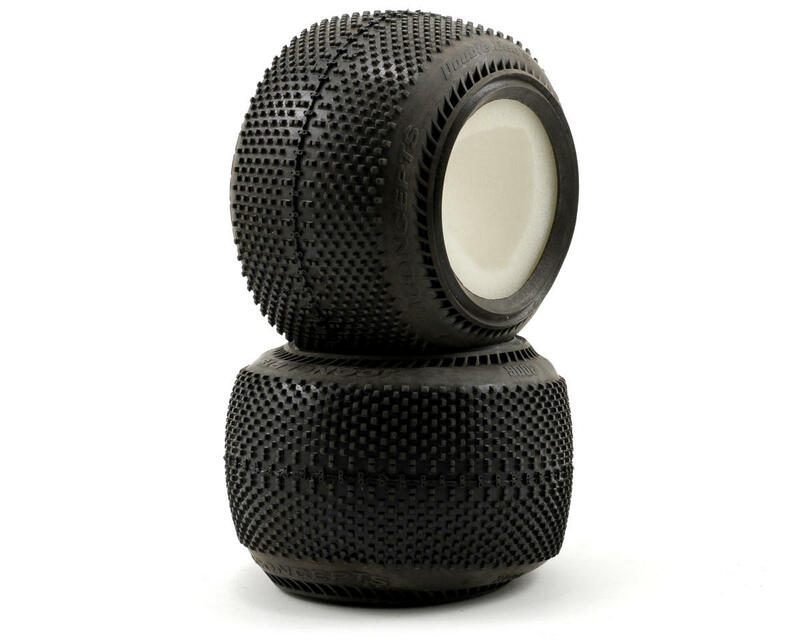 The JConcepts Double Dee’s 1/10 Truck tire is perfect for a variety of track surfaces. The especially unique Double Dee lug technology combined with the sticky green compound allow the flexibility necessary to compete on even the most demanding surfaces for an extended period of time. Double Dee’s are good to the last drop as the design allows even wear all the way down to the tire body. I really like these tires. I actually prefer these over Pro Line Hole Shot M3. Proline tire quality is far from par, there are so much flashing rubber and some of it is on the tread, which affects performance. Also, the foams in proline holeshots are horrible and they are deformed out of the box. 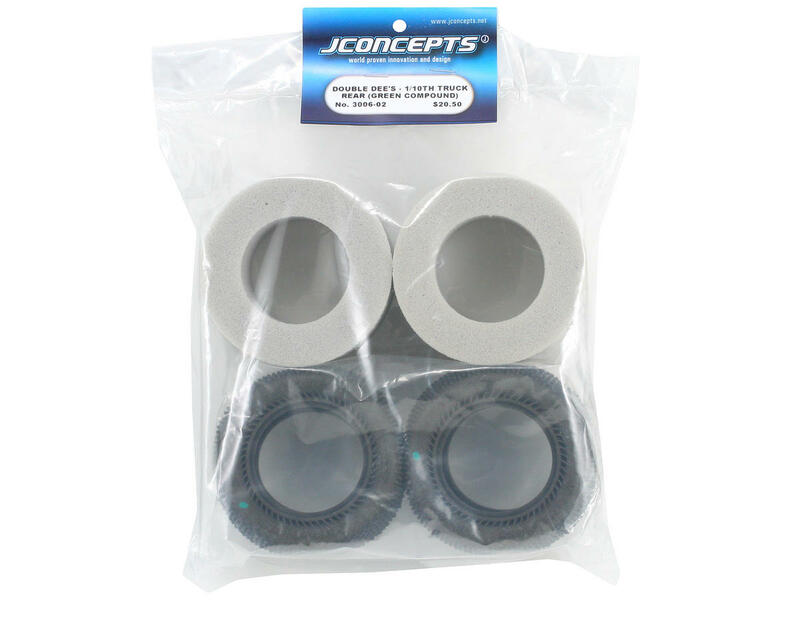 JConcepts has their foams outside of the tire. I still like to trim the inner and outer edge of the foams so the tire feels rounder. These tires last alot longer, better quality, same if not better rear traction, and are the same price as holeshots. BUY THEM! I picked these up for a brand-new indoor track. It's hard-packed clay-like with a layer of dusty granite-y stuff on top. I went out with my Goosebumps on my 22T before trying these (I'm pretty used to soft, loamy tracks) and had a really hard time maintaining rear traction. Most guys were telling me that Holeshots were working well for them, so I put on the DoubleDees on the rear and a set of FlipOuts on the front. The traction was very noticeably better. I can't say much for their wear since I've only put about 45 minutes on these tires but I don't expect that they'll be terrible. My only complaint was that there was some rubber flashing along the mold line down the center. No flashing on the bead, however. The Double Dee's tire is great for hard packed, dusty tracks. Quality is good, there is no flashing on the bead. The tread lasts longer than the Pro-Line M3 Hole Shot tires. I'll definitely buy these again. I thought I was getting traction on the track until I put these on. Like rubber velcro. Our track is typically dry with a layer of dust on top. Not ice, but pretty close to it when it comes to traction. More of a drifting track. I put these on today and took my 10TT to the track. I'm exceedingly impressed with them.